With ShootOFF and a laser trainer you can turn your dry fire practice into a realistic, effective, and fun training experience using your Windows, Mac, or Linux computer. ShootOFF gives you the power to make your own home shooting simulator and get the laser target practice your firearms training has been missing. Put a laser shooting range in your house today! ShootOFF is free software that enhances laser dry fire training by detecting your shots using a computer and a webcam. Process your shots as they happen with a training exercise to keep score, call out random targets, practice shoot-don't-shoot drills, and much more. Not interactive enough? 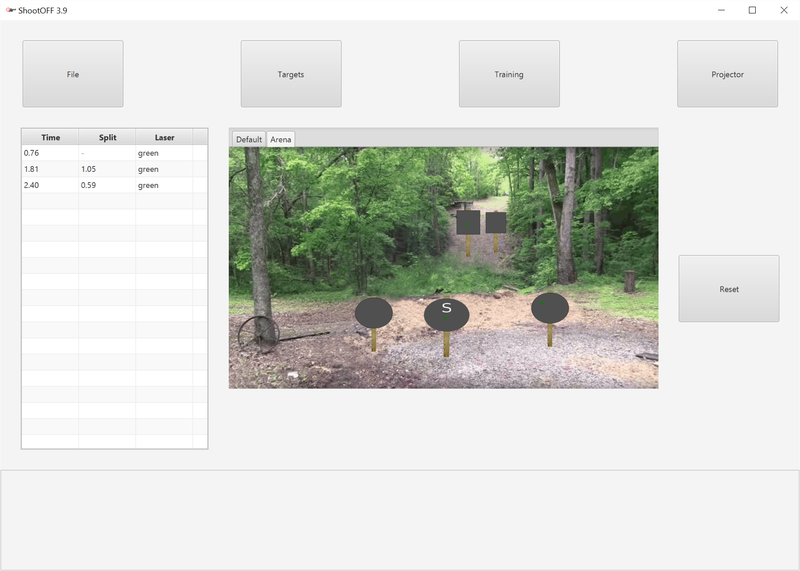 Connect a projector, set a background to one of the included wilderness and shooting range scenes, and add some animated targets. Turn on a fan and you might just think you're actually at the range! ShootOFF is intended to be used with laser cartridges sold by companies like Laser Ammo and LaserLyte and laser trainers such as SIRT sold by NextLevel Training. A more complete list of hardware for laser dry fire training is available on our wiki here. This project was started in response to the large number of expensive, unreliable, and primitive hardware products sold online to act as targets for laser dry fire training. Why buy new hardware when you can use hardware you already own with free software? ShootOFF runs on Windows, Mac, or Linux, just install the latest version of Java (minimum Java 8 update 40). 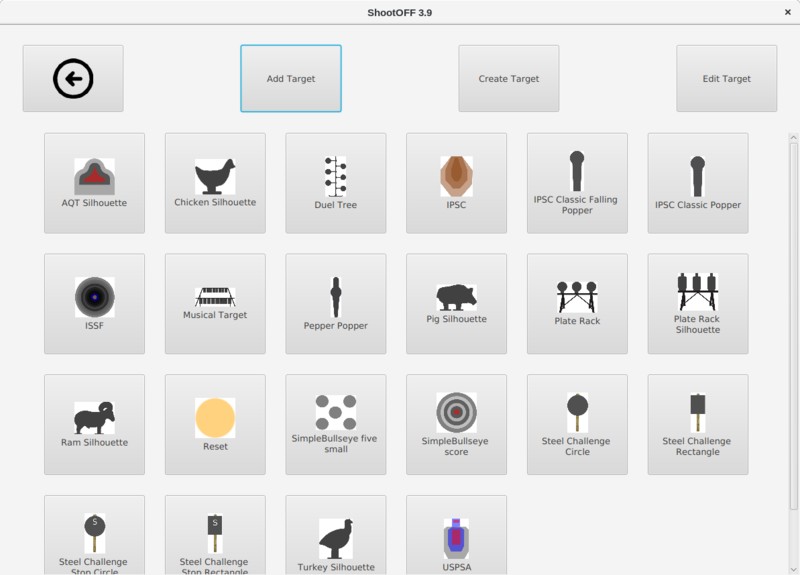 ShootOFF turns your home into a safe, clean shooting range you can use any time you want. Set up a full virtual shoot house at home using multiple cameras or simply use one camera for yourself and another for a friend during competitions. IP cameras are supported! ShootOFF comes with a number of targets. Not enough or missing something? With the target editor you can edit our targets or create any target you want! Using a projector or a second monitor enables the use of animated and moving targets, more realistic training exercises, and even video for more realistic training. Training exercises make dry fire training fun and more effective by helping you keep score, time drills, pratice shoot-don't-shoot drills, and much more. Record your shooting sessions to view them later or share them with a friend. Optionally record yourself shooting to check your form! 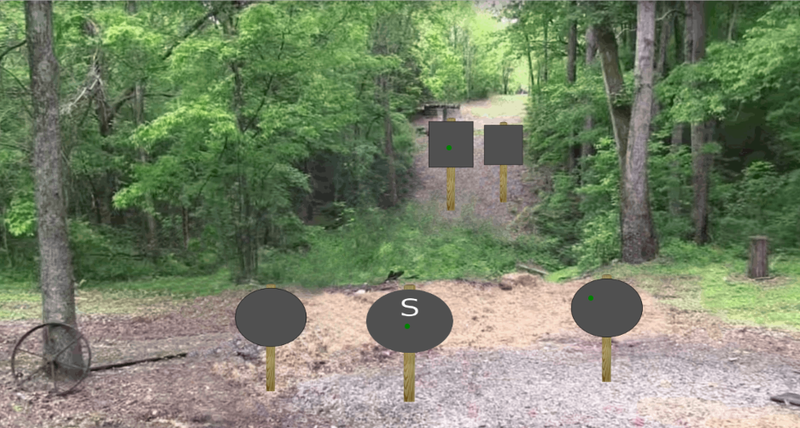 Virtual targets are used by training exercises to detect exactly where your shot landed on a physical or projected target. Print a target out, tape it to the wall, point your camera at it, add the corresponding virtual target, and line the virtual target up with the physical target. Using a projector? Just add the virtual target and you're done! Rich configuration options allow you to set shot sounds, ignore certain lasers, tweak shot detection, and much more. The configurable virtual magazine helps you practice reloads while you dry fire. Practice malfunction drills by turning on malfunctions and configuring the rate at which they occur. Our software is FREE as in no cost and free as in freedom: all of ShootOFF's code is provided free of charge to do anything you want with it as long as you comply with the GPL. The current stable version of ShootOFF is version 4.0, see what's new. Regardless of the operating system you are using, ensure you have the latest version of Java installed. Download the ZIP by clicking the download button below, extract its contents, and double click ShootOFF.jar. Linux users may need to use the command line instead: java -jar ShootOFF.jar. We work hard to ensure that our wiki is constantly up to date with the latest information for using, configuring, and troubleshooting the current version of ShootOFF. Please turn to the FAQ if you have any questions. If you have a suggestion or a problem that isn't addressed on the wiki please either join us on Reddit, email project.shootoff@gmail.com, or open a new issue on our GitHub issue tracker. We are always willing to accept code contributions on our GitHub repository. Please feel free to email project.shootoff@gmail.com or open an issue to discuss a feature you'd like to or are implementing. If you do not know how to write software, we are always looking for help in the art department (icons, graphics for the program and website, etc.). We can also always use help in advertising ShootOFF: tell a friend about the project, help a relative set-up ShootOFF, or post about your experience with the project on your favorite forum! We do not accept monetary donations at this time. We suggest donating to Project Appleseed or your local civil rights organization instead. If you make a donation out of gratitude for this project, please make us feel good by letting us know! Email us or open an issue on GitHub to ask for help, suggest a feature, or just tell us how we're doing! ShootOFF is free, open source software that enhances dry fire laser firearm training by detecting your shots using a webcam. You don't have to, but if you've never told us a bit about yourself we'd appreciate you filling out the survey below before downloading! What prevents you from training more? Have you used ShootOFF before? What's your email address (opts you into future emails about software updates)? You can skip the survey and just download ShootOFF.